Excuse me if I make a few clarifications. In reality, the Intergovernmental Panel on Climate Change’s Summary for Policymakers for their 5th Assessment Report was initially written by climate scientists for politicians. The language of the IPCC’s Summary for Policymakers was then amended by politicians during days of negotiations in Stockholm prior to publication. Additionally, the vast majority of the scientific research reflected in that document was funded by governments. As a result, the IPCC Summary for Policymakers presents only research efforts that adhere to the agendas of the political entities that financed it. Simply stated, the IPCC’s Summary for Policymakers was bought and paid for by politicians for political purposes. I would have to guess that you have confidence on the IPCC’s projections of future climate. Climate models are used for those predictions. Those predictions are based on projections of future emissions of manmade greenhouse gases and of other anthropogenic factors. 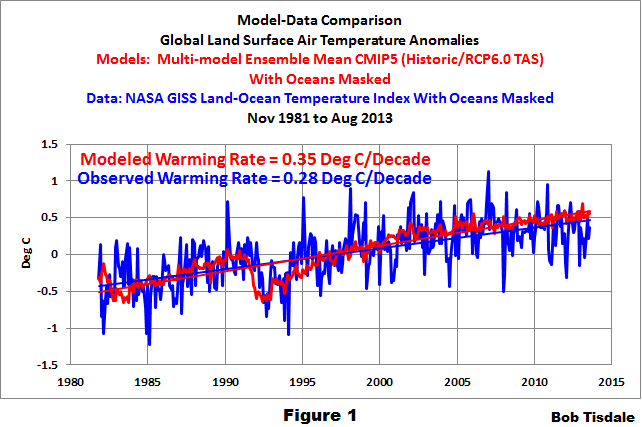 But, climate models are not facts; they are computer-aided speculation. Further to climate models, the predictions assume the models properly simulate climate on Earth. I hate to be the bearer of bad news: the climate models used by the IPCC for their 5th Assessment Report simulate Earth’s climate so poorly they are not fit for their intended purposes. I am an independent climate researcher, Mr. Secretary. I receive no funding other than from book sales and occasional tips from generous souls. I publish my findings at my blog Climate Observations and at the award-winning science blog WattsUpWithThat? I recently presented the modeled and observed warming rates of global land surface air temperatures and of global sea surface temperatures, covering the past three decades. 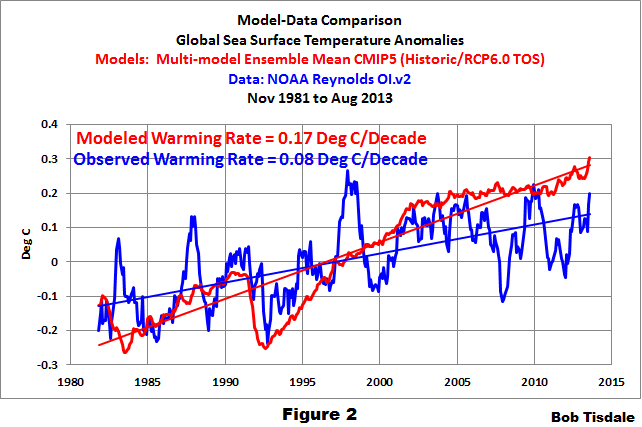 That blog post was Models Fail: Land versus Sea Surface Warming Rates. The cross post at WattsUpWithThat is here. (See that post for the specifics on the datasets, model outputs and the time period used.) I compared the warming rates in a table, but the relationships are much easier to see in the two time-series graphs that follow. Figure 1 compares the warming rates of the modeled and observed global land surface air temperatures over the past three-plus decades. The models performed well. They only overestimated the observed warming rate of land surface air temperatures by about 25%. The problem: they achieved that similarity in trends with skewed climate dynamics within the models. The vast majority of the warming of global land surface air temperatures, Mr. Secretary, is in response to the warming of the sea surface temperatures of the global oceans. [See Compo and Sardeshmukh (2009) “Ocean Influences on Recent Continental Warming.”] In order to achieve the close match with the observed warming rate of land surface air temperatures, the modelers had to double the observed rate of warming of the surfaces of the global oceans over the past 31 years, as shown in Figure 2. That clearly indicates the basic underlying physics within the models are unsound. Therefore, there are no reasons to believe the climate model-based predictions of future climate or any study that attempts to use climate models to attribute global warming and climate change to human influences. Those climate model failings stem from the focus of the climate science community on human-induced global warming and climate change — not on global warming and climate change regardless of the cause. I have been publishing comparisons of data with climate models outputs for about two years. The climate models used by the IPCC clearly cannot simulate Earth’s surface temperatures, precipitation or sea ice area. Additionally, there are numerous scientific research papers that are very critical of how climate models perform specific functions. Looking at those papers independently, the faults do not appear too bad, but collectively they indicate the models are fatally flawed. In my book Climate Models Fail, I have collected my past findings about climate models, and illustrated others, and I’ve presented highlights from the research papers critical of climate models. I would be happy to forward a link to a free copy of Climate Models Fail to your offices for your personal use. Please have one of your staff members leave a comment at my blog Climate Observations if that interests you. Now consider that suggested change of focus came from a country with 20% of its land surface below sea level and about 50% of it only a meter above sea level. If any country should be concerned about climate change, it’s the Netherlands, and they have asked for a better understanding of natural climate change. I suggest to you that the United States should also ask for that same change in research scope. With that change of focus, I personally believe, based on my own research, that climate researchers will find that the global warming and climate change we’ve experienced over the past three decades is primarily a response to naturally occurring coupled ocean-atmosphere processes, not manmade greenhouse gases. I also believe with the change in focus that, to the relief of most persons, future global warming and climate change will not be found to be catastrophic, but that we will have to plan for a long-term, naturally occurring rise in sea level. Sea levels were 4 to 8 meters (13 to 26 feet) higher during the Eemian (the last interglacial period) than they are today. (Refer to the press release for the 2013 paper by Dahl-Jensen, et al. “Eemian Interglacial Reconstructed From a Greenland Folded Ice Core”.) It would be prudent to plan for those same sea levels during this interglacial. Thankfully, with the slow rate of sea level rise, there should be loads of time to make sound economic decisions. Thank you very much for your time, Mr. Secretary. “We (the Dutch IPCC delegation) believe it is important that the scope of this statement [IPCC principles document] should be widened, namely that natural variability should be explicitly mentioned in the mandate of the IPCC. Collin Maessen: I quoted the KNMI document directly. I have in no way misrepresented what they wrote in that document. Bob, I quote a clarification from the KNMI showing that what you’re saying about their document isn’t correct. This response came from Rob van Dorland who is part of the IPCC delegation that wrote the document. Their response makes it clear what their intent is and what they mean with “The IPCC needs to adjust its principles” (which is the sentence right before you start your quote). That’s the mandate document, not the IPCC reports. If you don’t believe me: ask the KNMI if what you’re saying about their statements is correct. The Honorable John Kerry apparently believes everyone can have her/his own facts as long as they agree with his (Kerry’s) opinion. I think (read somewhere) he first met his current wife when many like-minded folks were at the first Rio Summit in 1992. So his commitment to the cause is not new – he is not taking his current stance because of his current boss. Still, the chance that he might read your post is greater than zero and he might even have a learning moment. I’ve read your recent post on WUWT and your exchange with Jo Nova on her blog. Looking forward to you suggested questions. Many journalists have only an introductory level college course in earth science. This is after they have been indoctrinated in earth-day and sustainability material in public schools. I have taught such classes (Intro. Physical Geography) and many students have cognitive dissonance because of what they heard in high school. Bob, I’m quoting from an email I got from the KNMI, something I clearly stated in my original comment. Here I clarified further that this response was written by Rob van Dorland, who is part of the KNMI IPCC delegation that wrote the very document you’re citing. I also said to contact the KNMI if you don’t believe what I’m saying. That way you can verify that what I’m saying is an accurate depiction of their response towards me, and so you can verify that what you’re saying is correct or not. There’s no need to call what I say a “lame argument” when I’ve told you who gave me that statement so you can verify everything. Collin Maessen: Let me try again. One last time. 1. Contrary to what you wrote, I did not misrepresent what KNMI stated in the KNMI document I linked. The document I quoted is available from the KNMI website. Anyone can confirm that I have not misrepresented what KNMI presented. 2. You have provided a quote from the IPCC that does refute what was written by the KNMI. 3. Regardless of what someone emailed to you, you have provided nothing to indicate that what I quoted was a misrepresentation of what KNMI wrote in that document from their website. 4. I will ask that you correct your blog post to reflect the above. 5. I will ask that you end this discussion. You are wasting your time and mine. One of the things I notice about real scientists as opposed to fake ones is certainty. Collin checked what the KNMI meant. You thought you knew better, Bob. You make my point very well. Then you insist on someone correcting their perfectly adequate and evidenced post because you don’t like what it says. If John Kerry reads your open letter, let’s hope it’s printed on absorbent paper. Fragmeister: Did you read the document from KNMI? And I can assure you that I have not misinterpreted it. Bob, you’re ignoring what I received from the KNMI that explains that what you’re saying about the passage you’re quoting is a (accidental) misrepresentation. I can understand that you might not want to take my word that this is an actual statement from the KNMI. But ignoring it isn’t a valid response, taking me up on the offer to verify this message would be. I will not correct my original blog post (reasoning for that is present in the blog post I referred you to). However, what I am going to do is disengage with you on this issue as there’s nothing further to gain if you are not interested in listening to constructive criticism. You are repeating yourself. I’m not going to repeat my answer to you. Anyone who follows my link can read exactly what KNMI wrote. That is all that matters. I’m tired of having you repeat the same tired message. If you repeat it again, your comment will be deleted. Great post, Bob. Reasonable people can disagree on climate science topics such as climate sensitivity, the formation and effect of clouds, etc but one thing there is no doubt about is that the IPCC is a political organization created to push the climate alarmism agenda. There is no reforming it and it is great to see Bob speaking truth to power.